Slip on our Men's Anakin Skywalker costume to change the course of galactic history this Halloween. 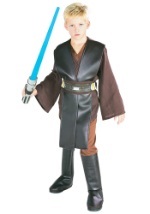 The officially licensed Anakin Skywalker costume has a polyester shirt and pants with an elastic waistband as well as boot covers which are sewn onto the pants. A polyester/foam combination belt is also included. Add Anakin's glove to cover his robotic hand, a lightsaber, and a pair of Anakin boots for a movie quality Star Wars look!